Oh Snap! The Friggin Amazing J.Ho Sketchblog...: EX-TER-MIN-ATE!!! I don't think this piece was completely successful. Instead of looking like a super-deformed Dalek, it kind of just looks like a misdrawn Dalek. What do you think? 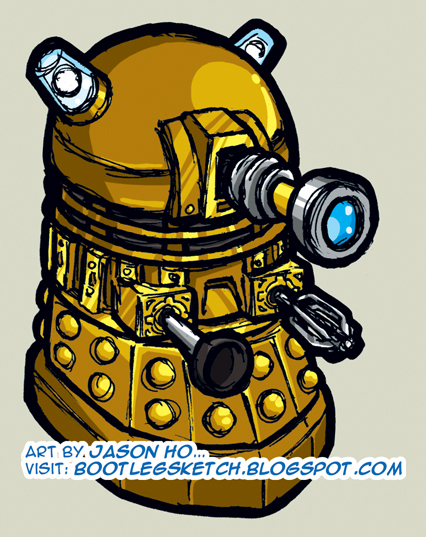 Anyways, it's colored gold, as per the most recent incarnation of the Daleks. A semi-significant art note, for anyone interested in the details--this is the first sketch I've posted where I've completely left the line art in black. If you go back and look at previous sketches, in each one almost all of the outlines are in color. Even most spots where the lines appear to be black, a closer look will reveal that it's usually a very dark grey, brown, or blue. The purpose of this is to "soften" up the sketch--excessive amounts of black sketch lines can look very harsh. However, harshness, I thought, would go well with a Dalek. I always thought the Daleks were kind of silly, I mean one arm is a toilet plunger, and the other arm is a cake mixer. What's scary about that? And then I started thinking about it while I was drawing this... one arm is a toilet plunger and the other is a cake mixer. Do not, I repeat: DO NOT, eat an unidentified cake, if Daleks are known to be within the area! Post Script: Regardless of what you think of the old Doctor Who (or even if you know nothing about it), give the new series a shot--it's a good time. finally! a little bit o' GENIUS! i still think the sketch is a little messy, but this time not in its sketchiness, but rather in the sketchy quality juxtaposed against the still rather tight and illustrative execution of the colors. free up your colors, leaning in the direction of the impressionistic, and u'll nail it! and the thought process of each post is becoming clearer each time, which is good. the process is not important in illustration or advertising, but it is in every other area of art. of course, it's up to u whether or not it's important to YOU. i prefer seeing the process since i love drawing so much. but it's an aesthetic learned. ren: glad you like it--the original version is a super-secret marketing weapon that is only to be posted when the time is right!